Each summer at UTR’s Escape To The Lake, it’s a treat to enjoy live music from a world-class roster of songwriters. However, many in attendance are also songwriters who come for inspiration or just to celebrate how music connects with our souls. This last July, one of those songwriters who we enjoyed meeting was North Carolina-based artist Hope Newman Kemp. At the time she was wrapping up production of a new full-length album Hoping For Real – which is available now to stream on Spotify or to download on iTunes. It’s a really ambitious project that chronicles the themes of Margery Williams’ classic novel The Velveteen Rabbit. We had the chance to talk to Hope this week about her career and new release. UTR: Before raising children and homeschooling became your major calling, you were out there singing on stage in the early days of Jesus Music. What are some of the memories of that time? Hope: In 1977 I was 13, and singing/learning to play, with an evangelistic group using racial harmony and music to preach the gospel of Jesus Christ. This group was called The New Directions and was led by a dynamic young preacher, J.L. Williams. Under his direction, every weekend and during the summers we traveled all up and down the East coast and set up anywhere- from park green to mall parking lot to beach front, and ministered in all kinds of churches and traditions, both black and white, high and common. We once opened for Andre Crouch and the Disciples (a musical hero of mine) but then we also performed for a crowd of 3 inside a high school auditorium, and all of it dedicated to using secular music to generate a crowd in order for J.L. to then jump in and start preaching the Gospel message. I was with the ND’s all through my high school years, and learned all kinds of music styles and church traditions- I realize now how unusual this upbringing has been. My own religious education was also a bit unconventional; in the early years was familial neighborhood baptist, but by 9 years old my parents had left that tradition in favor of the Jesus movement and meeting in homes several times a week. These were my formative years musically, and because of financial circumstances I didn’t start piano lessons until nearly 10 years old- so all the high-classical caliber training was being informed by the real musical presence I was immersed in: the big band rhythms and vocal phrasing, the southern gospel harmonies, the messianic jewish scripture songs, the Jesus movement free-spirited song flows, the black gospel vulnerability and accessibility- all of it kind of mixed up into a big bowl of musical soup for me. Add to that the flavors of the day: classic southern rock, poetic songwriter; but my meat and potato Christian music influences were Keith Green, 2nd Chapter of Acts, Andre Crouch, Danielle Hall, Honeytree, Reba Rambo, Michael Omaritian, Koinonia, Lamb, – all that early good stuff of Sparrow Records. UTR: At what point did you find yourself songwriting once again? Hope: I never stopped songwriting. As a young mother songwriting was the way to keep my heart working on something good and noble while tackling the mundane, everyday routine tasks and chores of life. It was either sing a song or whine and complain. I wrote songs about folding laundry, washing dishes, bathing children, homework, scrubbing toilets, preparing meals. Also, ditties about walking in the park, love songs about fidelity and conflicts off marriage- as well as praise choruses, worship music, and scripture music. It wasn’t so much that writing was therapeutic- that was by default- but that writing was and still is a natural way that I take and handle the world. We lived for several years in Germany while my husband served a tour of duty with the Army. During that time I gathered with other Army wives to create community, support each other in prayer, and study the Bible. It was here that I began to understand my own usefulness in singing, playing the piano, and leading in song. I didn’t realize how the natural response I had to sing and make song (thus a more merry method of performing an uninteresting task) was actually not a natural thing for my fiends, and they actually needed it. 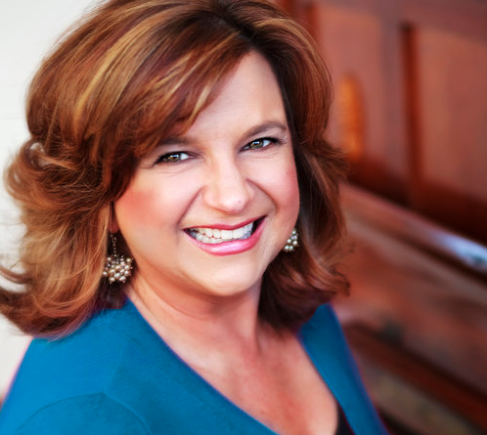 So, I began bringing praise choruses, hymns, and worship songs to our gatherings. In 1998 I was invited to participate as the Worship Leader for PWOC (Protestant Women of the Chapel) training conference in Germany and since then have returned to do the same in Germany and also Japan.. This conference rotated speakers like Elisabeth Elliot, Dee Jepsen- so with the invitation came the request “bring your cds!” of which, of course, I had none! I had to get busy learning how to do that, and not living in a music making saturated area of the country this was quite an endeavor, but I learned how. Along the way, I worked with Elon University Pericles Project recordings- which has been a very gracious education for me. But then my children grew up, and I found myself in this window of creative opportunity- only I hadn’t really planted the seeds for anyone to really know me outside of my own community. Add to that, the entire industry had morphed along the way from analogue to digital recording, and with that came digital distribution; all new tricks for this old dog. I’m not really a performing artist, and have never wanted to be one really- not in the industry way- so I found myself on this strange threshold; Now I have all this available time and resources to pursue what I love to make, but no real ends for why to do it; no history with an audience, no accolades or relationships by which anyone would even care to listen, but yet with a lot a passion and more available time than every before. In my neck of the woods, and for a young mother with children, there really isn’t a lot of opportunity for exposure to your work in those days unless you gigged a lot; and since the church gig scene really disagreed with me personally, and my husband is not in the music scene with me, I kind of locked myself up when it came to figuring out a way to make music and have anyone really be able to listen to it. That’s how the idea of “Hoping for Real; songs inspired by The Velveteen Rabbit” was born. I had crops of new songs that didn’t really fit a genre; not quite CCM, but not pop either, and besides- neither of those platforms were really interested in a middle aged no name anyway but still, I was writing. And recording- recording has been, because of my circumstances, my “audience” and creative lab. I absolutely love the studio. But why record if no one needed it? I mean, who is really wanting to hear from an older woman? And why write it if it wasn’t going to ever leave my living room- and yet, I grew increasingly passionate about not going to my grave with these songs stuck in my head. My daughter-in-love, herself a songwriter, was recognizing this dilemma and she encouraged me to record a concept album, a song series based on a book; and by doing this I’m not needing to worry about promoting ME, but the concept, the music, the story. This idea just sparked something brand new- the practice of writing to ideas wasn’t new, but putting them all in a single collection was a new idea, and it simply lit up all the right parts of my very dry and needy creative soul. UTR: What is the overarching theme of your new album Hoping For Real? 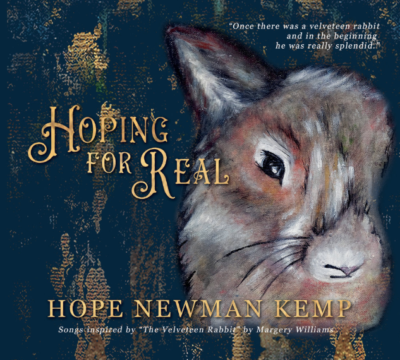 Hope: Hoping for Real is a concept album based on the beloved book, The Velveteen Rabbit. The story itself is compelling. It holds what I call a Gentle Importance; that is, the kind of thing that makes one stop and think, consider, but it’s not so on the nose that it does all the thinking for you. There are folks who were raised on the book who tell me they love it, how important it is to them. Entire college courses have been designed around this little book. I had no idea it’s impact and affect until beginning to use it to create the framework for writing the songs. Learning of people’s love for this little book has helped me be very intentional and careful towards craftsmanship and respect for the story. I chose this book because I wanted to write and record a song cycle, and therefore needed a story to do that. Because I had never done this before, I needed to choose a book that wasn’t too burdened with plot changes and dialogue; I wasn’t interested in writing musical theatre, but in writing actual songs- songs that stand alone, but together inside a collection actually do tell a story. It has caused a little bit of confusion choosing this book, because it is after all a children’s book- and so folks naturally think the music is made for children. It is of course completely acceptable for children (my own grandchildren listen all the time, so their parents tell me), but I believe the story is really one of those grown up kind that is told through a children’s book. So, while the project that I’ve made is neither specially designed for musical theater, or as a children’s book, it’s really bringing this story up to the level for adults to participate. UTR: Who were some of the contributors to the making of this record? Hope: Benjamin Hardesty, front man and songwriter for The Last Bison, is the producer on this project. I have followed him since his “orchestral” days, and really didn’t expect that he would be interested in producing the project but he responded extremely enthusiastically. I wanted a producer with a sensitivity towards the project that could produce to the song, and not necessarily my voice. My experience has been that folks want to curate the sound of my songs towards a soul or motown feel, and that’s very flattering, but it wasn’t what I wanted for this project. But I didn’t know how on my own to convey what I was hoping for, so I am thankful for Ben’s leadership. He, in turn, was able to pull in members of his band to help out on the project. One of the things we decided early on is the assignment of instruments as actual characters throughout the recording. For example, my son (David Kemp) plays Guitar on the project- everywhere you hear Guitar is reference to Sun, Light, Warmth – we assigned the Guitar as the Guiding Star, and there are several references to a Guiding Star, all the way to the end of the story. Bells are signaling the Nursery Room, Chimes tell us the Nursery Magic is present, all these instruments created an audio palate to work with in making decisions regarding arrangement and orchestration. Nothing is unintentional or acting as a place holder. All of the sounds help to tell the story. This idea happened between Ben and me organically, and quite by merry accident- and became so helpful to me as a songwriter that I doubt I’ll ever record any other way again. UTR: What is story behind the making of the song “Cowboy”? Hope: Cowboy is my favorite song on the recording, although perhaps the most understated. But the reason I love it so much is because it is the first song I’ve ever written to a story before, and is by far one of the most complicated kinds of music writing I’ve every had to do. The song of Cowboy happens at the point of the story where Skin Horse has a long conversation with Rabbit in the nursery. This conversation is crucial because Skin Horse (thus called because he has been so well loved that his fur is rubbed off down to his skin) teaches Rabbit about how it is love that is what makes one real, and if Rabbit wanted to be real he must be willing to also suffer the pain of being loved; losing his whiskers, fur, becoming misshapen, worn. These things are the evidence of being loved. The story could not really exist in it’s profoundery without this conversation. I didn’t really want to on the nose “tell the story” of what was happening here, but needed to have a song that held this position. But how does one write a song about it? I mean, singing the words “Skin Horse” is a bit ungainly and graceless, unless of course utilizing the forgiveness of this kind of awkwardness like musical theatre provides. And, it was not just the conversation that was important to tell, but also the content, and finally the characters themselves- all of it was important in my mind to somehow convey. I could’ve written a song informed by the conversation; a song about how Love and learning to love is what makes us who we are, but really, that alone wasn’t satisfying enough. I also wanted to somehow write a song that lets the listener understand that they are in on a conversation themselves. I had put myself in a real corner with all my requirements. So I sat at the piano and prayed- I did. I really prayed about how to write this song, what to say, how to tell the story without telling it, how to convey the message as a conversation. And the question occurred to me, “If I were Rabbit in MY world, who would Skin Horse be?” And sure enough, he’d be an old wizened and patient Cowboy, one accustomed to finding direction by a North Star (a Guiding Star), and finding no care in his irregular and malformed appearance, because he knows the truth, and the truth is his reality; Love is what made him that way and so he loves also. And so, Cowboy was born, and is my favorite character- in this song the sun transforms to Guiding Star (also the promise of hope), and little pieces of the song are reprised throughout the rest of the project. And along that line, the over arching theme is “I was made to love you”, which is a phrase played and sung all throughout, and can be rightfully interpreted almost any way you read or hear it. It was Augustine who stated, “Thou hast made us for thyself, O Lord, and our heart is restless until it finds its rest in Thee” and this confession is the foundation for the Theme; we want Love because we are made to want it- because ultimately we are made to Love our Creator as He loves us, and as He made us to love Him, and others. We’ve just forgotten how, we’ve forgotten why we are made. And we so often make the same mistake in thinking that Rabbit made; that it is Love itself- someone loving us- that makes our reality, but that isn’t quite all there is to it, is it? Love is more than just being loved- we must also love, and yet we cannot imagine loving unless ourselves being first loved, and because our love has fallen and become broken, Love isn’t possible without pain. And this is where Rabbit lies. Cowboy knows. UTR: In what kind of settings do you hope to perform these songs live? Hope: I have performed these songs together as a theatrical concert, or musical reading- although that wasn’t the intent, the genre was quite accidental.Think musical theater in reverse; the Book is read, and where the columns supporting the story come, there is a song- with underscoring behind the reading and transitions between songs. This happened because I wanted to do a traditional cd release concert but it seemed natural to also read the book, and thus a show was born. But several songs have been performed separately from the collection, “Find Me”, “Cowboy”, and “This is Why” most often. The only song I’d say is not distinctly attached to the collection would be what we call the finale, which is “Something Real”, and there I just went ahead and caved to my stage-writing instincts. Oddly enough, Something Real is actually a favorite to quite a few. It’s interesting to me what songs are the favored of certain kinds of thinkers. UTR: What are some other ways you could potentially minister in different communities? Hope: Right now I see myself as a content maker: that is, I love to make musical content that is custom to what is needed for that particular event or moment. I’ve written for theater groups and underscoring for projects. For example, I have songs at the ready to make another project based on a book, but I’m also looking at writing for Scripture stories (like Ruth or Esther), and have put many psalms to music- just to help me memorize if for nothing else. Another idea I am working with is writing what I call “songs for the journey”- an earthy gospel style that hopefully is accessible and easy to follow, and remember, sing along, encourage our Faith walk. I also am very at ease, and indeed this is my heart love, with leading worship for prayer retreats and conferences, and absolutely love that foremost-especially since I play piano for myself. But, I also sing as a vocalist in a Big Band, and am prayerful about how to pursue that arena as well; in all, the Lord has given me a phrase that I have to come back to and use whey I get discouraged about trying to figure out what my art is, and that is, “Be an Art mind for my christian community, be a Christian mind for my art community.” with all of it dedicated to the Glory of God and for the building of HIs Kingdom, for His purposes. Soli Deo Gloria- and that’s really all I know.